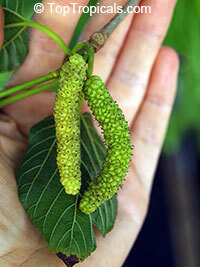 Giant fruit Mulberry - makes 2-3" long fruit! A beautiful ornamental bearing sweet, juicy fruit. Tastes like extra-sweet blackberries. Disease and drought resistant. Beginning the very first year, you can enjoy its fruit all spring.